Hoonah–Angoon Census Area is a census area located in the U.S. state of Alaska. As of the 2010 census, the population was 2,150. It is part of the unorganized borough and therefore has no borough seat. Its largest community is the city of Hoonah. Boundaries of the former Skagway-Yakutat-Angoon Census Area. The census area was significantly larger in the 1990 census, at which time it was the Skagway–Yakutat–Angoon Census Area. After Yakutat was incorporated as a consolidated-city borough on September 22, 1992, it was renamed Skagway–Hoonah–Angoon Census Area; When Skagway followed suit on June 20, 2007, the census area assumed its current name. Note: Demographic data below is for the former "Skagway–Hoonah–Angoon" Census Area, which still includes Skagway Borough. As of the census of 2000, there were 3,436 people, 1,369 households, and 866 families residing in the census area. The population density was 0.30 people per square mile (0.12/km²). There are 2,108 housing units. The racial makeup of the census area was 58.15% White, 0.15% Black or African American, 35.01% Native American, 0.38% Asian, 0.15% Pacific Islander, 0.96% from other races, and 5.21% from two or more races. 2.82% of the population were Hispanic or Latino of any race. 3.95% reported speaking Tlingit at home, while 1.83% speak Spanish . There were 1,369 households out of which 30.80% had children under the age of 18 living with them, 49.30% were married couples living together, 8.40% had a female householder with no husband present, and 36.70% were non-families. 30.10% of all households were made up of individuals and 5.60% had someone living alone who was 65 years of age or older. The average household size was 2.50 and the average family size was 3.14. In the census area the population was spread out with 26.80% under the age of 18, 7.10% from 18 to 24, 29.50% from 25 to 44, 29.30% from 45 to 64, and 7.30% who were 65 years of age or older. The median age was 38 years. For every 100 females there were 116.40 males. For every 100 females age 18 and over, there were 120.70 males. 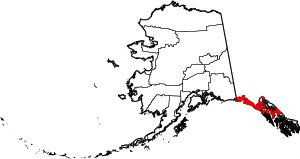 ^ The census area acquired its current name in 2007, after Skagway Borough was created. ^ a b "State & County QuickFacts". United States Census Bureau. Archived from the original on July 31, 2014. Retrieved May 18, 2014. ^ Population of Alaska by Labor Market Region, Borough and Census Area, 1990–1999, Alaska Department of Labor and Workforce Development. Accessed January 20, 2009. ^ June 5, 2008 election, Skaguay News, summer edition, 2008. Page 17. Wikimedia Commons has media related to Hoonah-Angoon Census Area, Alaska. This page was last edited on 30 December 2018, at 04:29 (UTC).